Xavier Washington makes a tackle. The Northwestern football player was arrested Sunday in connection with drug possession charges. 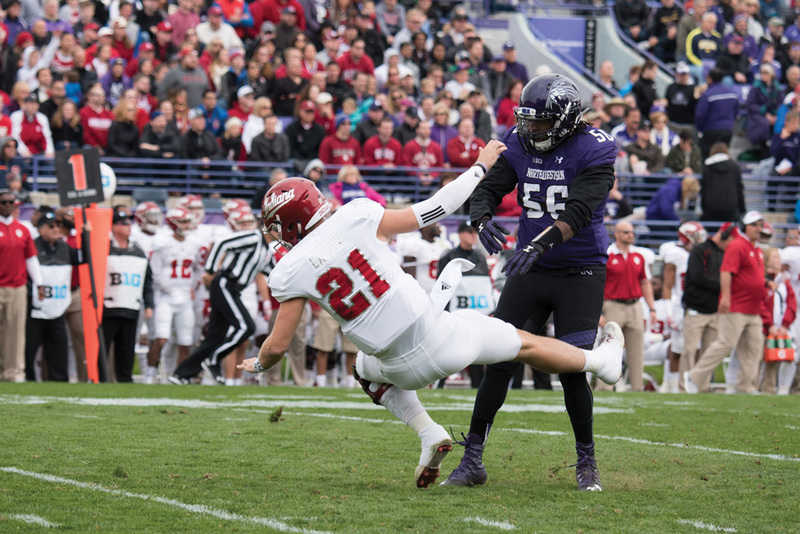 Northwestern defensive end Xavier Washington has been suspended indefinitely from the football team after being arrested Sunday, a University spokesman said in a statement. Washington was arrested in connection with possession of a controlled substance early Sunday morning near the intersection of Brown Avenue and Simpson Street, Evanston police Cmdr. Joseph Dugan said. Dugan said officers were called to a disturbance in the 1900 block of Foster Street at about 3:30 a.m. Washington fled on foot, and was stopped by officers who found 0.5 grams of cocaine on his person, Dugan said. Washington was charged with one felony count of unlawful possession of a controlled substance. The University is currently investigating the matter, the statement said. Athletic department spokesman Paul Kennedy deferred comment to the University. Washington is a consistent starter for the Wildcats. The Texas native is a Communication junior.